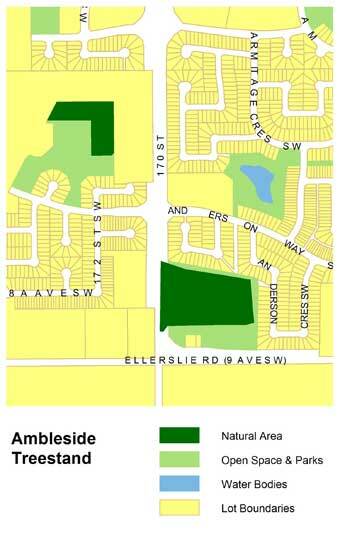 Ambleside Treestand is a deciduous stand dominated by trembling aspen and balsam poplar, with an understory common to mixedwood stands in the region. Diverse habitat offers breeding habitat for birds, and foraging and cover habitat for mammals. Deadfalls and snags provide habitat for woodpeckers and insects. The site also offers good nesting habitat for songbirds. The natural area serves as a stepping stone for wildlife dispersal and access to feeding, cover and thermal habitat. 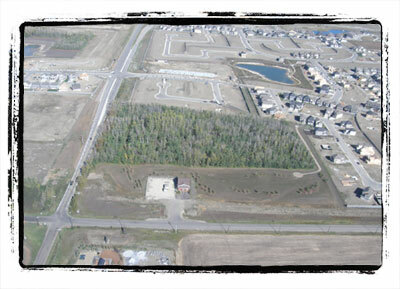 The site is located east of 170 St. and north of 9 Ave, with access from 170 St. There are no formal trails through the natural area; however, the surrounding buffer area and open space to the south of the stand provide views of the treestand from all sides. Keep an eye out for Least Flycatcher, Black-capped Chickadee, House Wren, American Robin, Cedar Waxwing, Yellow Warbler, White-throated Sparrow, Song sparrow, Brown-headed Cowbird and Baltimore Oriole, as well as small mammals.